The Israeli Aircraft Industry (IAI) took a major step forward when the flow of combat aircraft that Israel was buying from overseas manufacturers came to an abrupt halt in 1969. Israel's frontline fighter was the Dassault Mirage III and the Israelis had been working with Dassault engineers to improve the capabilities of the Mirage III as well as to develop a simpler fighter-bomber variant that would become the Mirage V. When Israel learned that an Arab attack was imminent, it conducted a pre-emptive strike to blunt the effectiveness of the Egyptian Air Force. This resulted in an embargo that saw the Mirage 5Js that were needed for combat duty held up in France. The first major project for IAI was the Nesher (Vulture) - a copy of the very Mirage 5Js they'd paid for using Mirage III patterns and intelligence. The Nesher entered service in 1971 and saw combat in the 1973 Yom Kippur War. As the Israeli Air Force transitioned into the Kfir, Argentina purchased the surplus Neshers which were refurbished and delivered as Dagger. These Argentine Daggers began a modernization program in 1979 to bring the aircraft's avionics on par with Israel's Kfir C2. These modernized aircraft were designated Finger though the UK embargo against Argentina from the Falklands War forced the replacement of British made avionics with their French equivalents. Wingman Models has an interesting symbiotic relationship with Kinetic Models where they will produce variants from a given Kinetic release which cannot (usually) be built from the Kinetic kit. When Kinetic Models released the Kfir series, Wingman Models produced two releases that featured unique variants/derivatives that can't be produced directly from the Kinetic tooling by supplying a nice array of resin conversion and detail parts. In this release, Wingman Models has transformed the recent Kinetic Models 1/48 Mirage III tooling to replicate the IAI Dagger and its derivatives. While the Kfir and Mirage V/Dagger are similar in appearance, Kinetic adjusted the fuselage profile to differentiate between the J79 and Atar-powered airframes. The Kinetic kit is molded in light gray styrene and presented on seven parts trees plus a single tree of clear parts. The injection molded parts look like Hasegawa quality these days. The Wingman Models additions include a large bag of resin parts, two small frets of photo-etched details, turned brass pitot tube and AOA sensor, and a set of yellow-tape canopy and wheel masks. 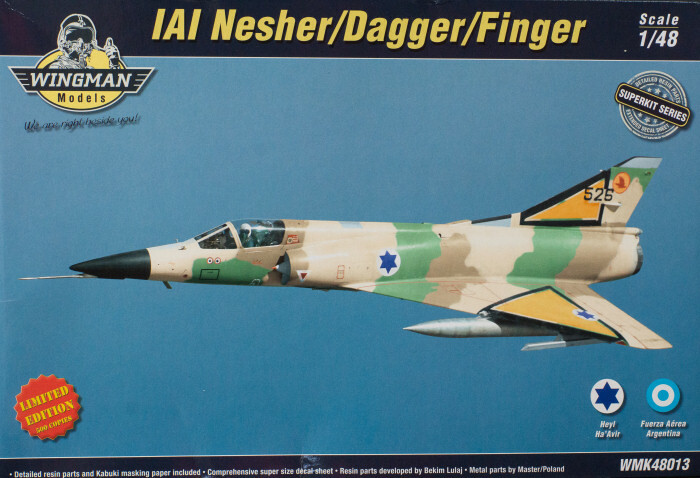 Out of this box, you can build the IAI Nesher, the modernized Dagger, the updated Finger, or the Mirage 5P Mara. These decals are nicely done and include a nice suite of airframe stenciling. Painting instructions are provided using FS 595 color references for the IAF subjects and Gunze Mr.Hobby colors for the FAA subjects. This is another very nice release from Wingman Models and renders the only trainer variant of the Kfir series (in plastic).